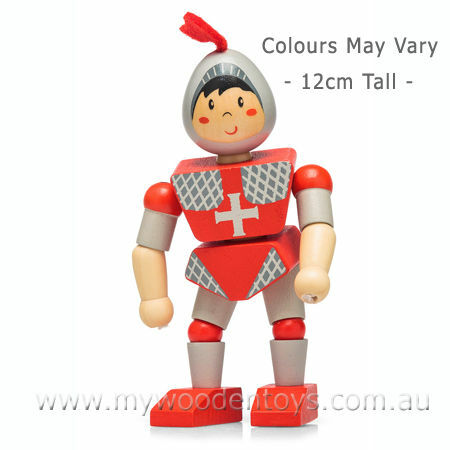 Wooden Toy Flexi Knight is a strong well finished wooden toy all ready to take part in medieval battles and stories. This 12cm tall knight is jointed and held together with elastic so you can twist and turn him into all sorts of positions. He has nice big feet so he is easy to stand up (useful when fighting dragons or the cat) and the attention to detail is just lovely with felt plumes in his helmet. Please note this knights colors vary. We like this because: "great inexpensive little toy and wonderful for roleplay. "